The Directive Affirmation is a paragraph written in the first person present tense that describes a person’s goal, pay-value of the goal, plan to reach a goal and habits and attitudes affecting the goal. It is rehearsed repetitively, causing the Self Image to change. Step 4. Outline the plan to achieve the goal. Run a Mental Program (more on this in a moment) on each shot. Visualize taking 10 perfectly executed shots in the morning when I wake up, and before I go to bed. During practice, visualize myself having shot several 10s in a row, and then shooting another unfazed or influenced by the prior shots. Keep a written reminder to dryfire every 3rd shot in competition to ensure I am flinch-free and only the muscles in my trigger finger are activated in the shot. Read and visualize my Directive Affirmations daily. March 31, 2014. I always shoot at least 96% in the standing phase of competition. I have taken my next step towards earning High Master classification. I always run a Mental Program on each shot in practice and in competition. I visualize taking 10 perfect shots when I wake up and when I go to bed. When I practice, I visualize myself unfazed by the fact I am shooting 10s, because shooting 10s for me standing is as normal and like me as shooting 10s in prone. In competition I dryfire after several shots and my body simply flows with the rifle’s recoil. The muscles in my trigger finger are the only muscles in my entire body that move during a shot. I always shoot at least 96% in the standing phase of competition. Step 6. Write down the Directive Affirmation in my own handwriting on cards, at least 5, and put them in key locations each day. Every time I encounter a card, I read the Directive Affirmation. That’s it! As for the Mental Program, that is basically a mini-mental rehearsal for each shot. I have started using this technique but not consistently. Sometimes my mind is just blank, which is OK I think. When I find myself thinking about anything else, I run the Mental Program. It is probably better to run the Mental Program every shot, so I will start keeping track. Basham gives a Mental Program for shooting in his book, so I’ll just use that. Basically, you just visualize yourself and how you feel after making a perfect shot. Then you visualize yourself doing it. Then you focus your attention on what you need to do to shoot and shoot. 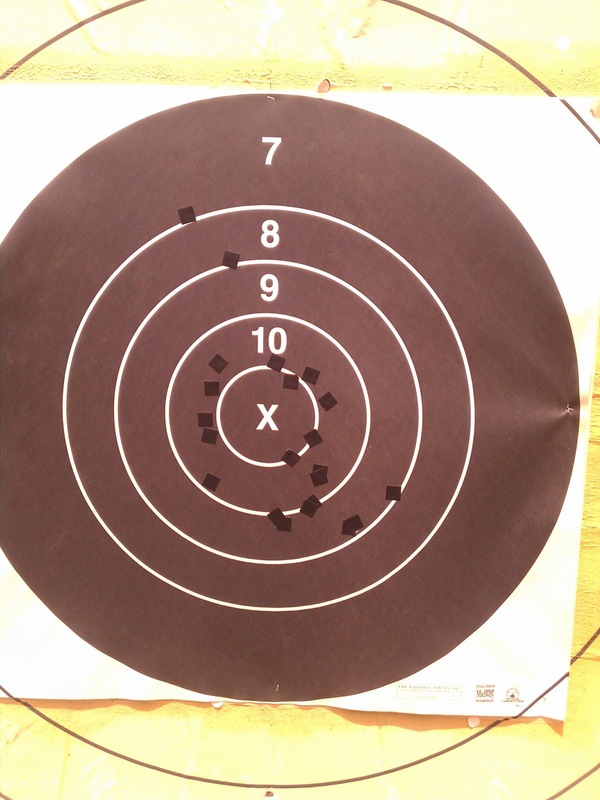 This entry was posted in Mental Management, Shooting Tips on August 22, 2013 by jMark74. Readers following the blog know that I have been struggling to get my off hand scores in competition to match my practice scores. Put another way, I have not been shooting as well in competition as I do in practice. This past weekend’s match was a typical example. 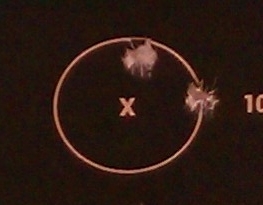 My first two sighter shots standing were a 10 and an X. I was calm and focused for my first record shot, a 10. Then suddenly my pulse began racing, and I shot two 8s. Those two 8s were a sort of pressure relief valve, letting me be calm again. My next 6 shots were 9-10-9-10-X-10. So not withstanding the two 8′s, my score is 84, with a potential 94, which would match my personal best in competition. For my final shot I was not nervous, but somehow shot high with a 7, finishing with a 91. In practice I am shooting 96+, and there is no logical reason I shouldn’t be shooting at least that well in competition. In fact, I have the SCATT set to make it harder to score in practice. Enter Lanny Bassham and his “With Winning in Mind” book and Mental Management CD seminar. Bassham is a former Olympic gold medalist in shooting, who developed a “mental management” system for training the brain for top performance. I first read his book several years ago, and dismissed it as Tony Robbins-like feel-good nonsense. But recently I read the autobiography of former Navy Seal sniper trainer Brandon Webb, and he wrote that initially he had the same doubts about Bassham, but sniper trainees were greatly benefiting from Bassham’s books and CDs, setting new course records. So I decided to give Bassham another shot, and was able to find his seminar CDs for sale used, from a very accomplished shooter who gave the CDs high marks. It turns out that Bassham’s CD seminar goes into much more detail than his book, and won me over to try it. The core of the system is Bassham’s model of mental performance. He identifies three “circles”, the conscious, the subconscious, and the self-image, which need to be in balance. The conscious and subconscious circles are fairly self-explanatory, i.e. the former is focus and concentration, the latter is the muscle-memory skills developed through hours of practice and repetition. But the self image circle? Bassham says that how you see yourself influences how well you will shoot, and that self image will propel you or pull you back. Even if you have the conscious and subconscious ability to shoot 96+, if your mental image of yourself is that you typically shoot 92, you will typically shoot 92. If you start shooting better than that, your nerves and subconscious will pull you back. If you start shooting worse, you’ll focus more and bring the score up to that average. Your self-image basically anchors your performance, in that you will experience debilitating discomfort and distraction any time you are shooting worse, or motivating energy when shooting worse, than your expected performance. Bassham says that shooters with my dilemma are very common, he calls them the “frustrated experts” who shoot outstanding in practice but not in competition. The key, according to Bassham, is that I must change my self-image. The practice data says I can shoot a High Master off hand score. So why shouldn’t I think of myself as High Master off hand shooter? If I really saw myself as a High Master off hand shooter, then I wouldn’t start to get nervous as soon as I start shooting well off hand in competition…after all, shooting 10 after 10 in competition is normal for a High Master. I know I can shoot High Master scores in prone. My first 9 shots prone this weekend at 600 yards were 10s and Xs, and I didn’t get nervous or flustered…that’s “like me” to shoot well prone…I finished this weekend at 96%, just shy of High Master. 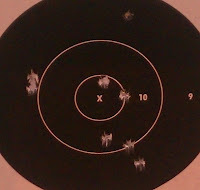 I have to convince myself that it’s “like me” to shoot well standing off hand. In other words, make my self-image guide the scores, and not the other way around. 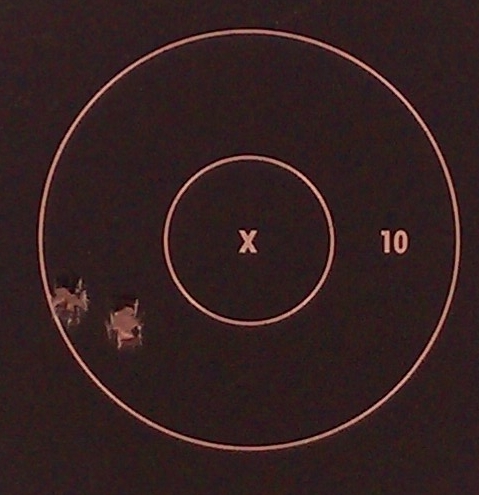 This entry was posted in Mental Management, Shooting Tips on August 19, 2013 by jMark74. This weekend was a turning point in my shooting development. I am now convinced beyond any doubt that I have the technical skills to shoot at the High Master level. What is lacking, and what I need to change, is my mental preparedness to shoot at that level. This post I will illustrate the problems, and in subsequent posts I’ll discuss my progress in training techniques, all coming from the “With Winning in Mind” books and tapes of Lanny Basham. Now it hits me. For off hand shooting, both my sighters and record shots are super tight. My zero is near perfect. My hold today is super tight and slow. I could shoot a perfect target if this keeps up…. 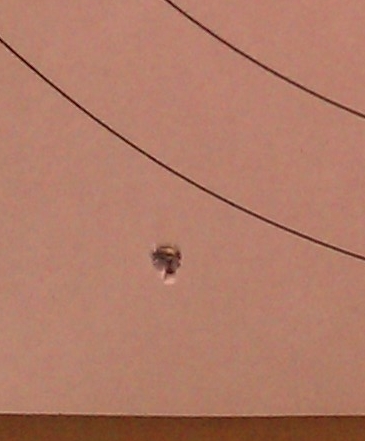 Yep, another off-target miss caused by flinching, because I forgot to dry-fire a couple shots to immunize myself. Lesson learned. Arrghhh! Never mind that I haven’t shot an 8 at 100 yards for months. It’s all a blur now, I can’t even explain how it happened. Anyhow, the point of the pictures above is to demonstrate my need to win the mental game–I’ve got the physical skills. In future posts I’ll talk about what I’m doing to get there. Wish me mazal tov! This entry was posted in Shooting Tips on August 5, 2013 by jMark74. The Tavor is proving to be quite the Israeli ambassador! 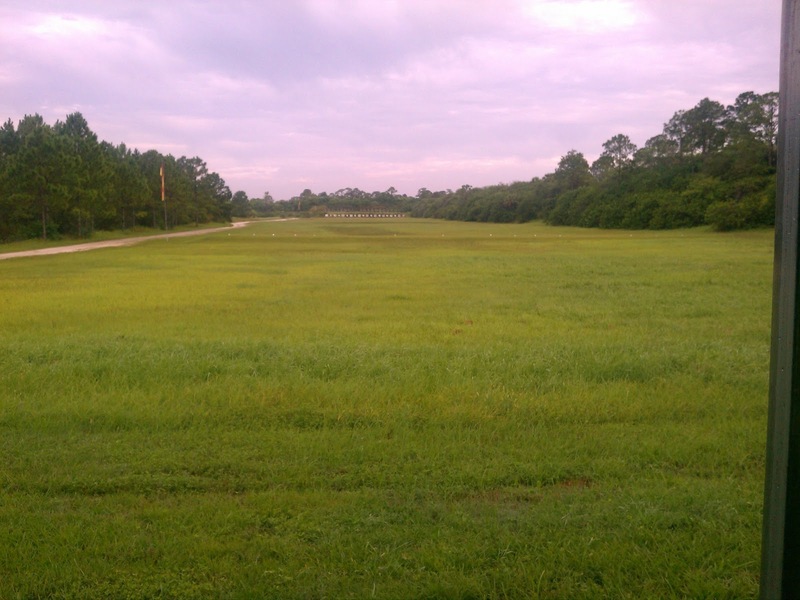 This entry was posted in Tavor on August 1, 2013 by jMark74. Only Sergey can say exactly why he does it. But for me it seemed like an obvious way to “prime” the muscles of the trigger finger to operate independent of the rest of the hand, and thereby avoid disturbing the hold. Let me give some background. The standing position without a sling is the most unstable position in the shooting sports. That makes it the most challenging, most frustrating, and most fun. The body naturally moves, so you have a sense of a moving target. It is a lot harder to make the body perfectly still than most people would think. There are so many dynamics to successful standing shooting: good balance, extremely fine muscle control, and good reflexes. Depending on the weight of your gun, endurance as well. And don’t forget chutzpah (you need it most in the standing position), and a bit of mazal never hurts. 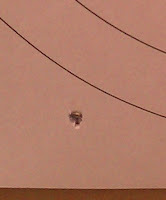 In High Power, for the standing stage the target is at 200 yards, with a 7″ 10-ring (3.5MOA) and a 3″(1.5MOA) X-ring. Broken down, there are two elements to successful standing shooting: your hold, and your triggering. Your hold is the natural path your muzzle takes as your body moves in position. Shooters practice making this path as small as possible. 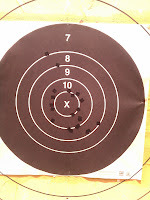 Beginners will have trouble keeping the muzzle within the 7 ring, top shooters can hold the 10 or X. Right now in NRA High Power my hold is mostly a 10 ring hold, at times an X-ring hold, and sometimes a sloppy 8.5 or 9. You don’t need a perfect hold if you have good reflexes and can release a shot “on the move” as your muzzle first enters the 10-ring. Even if you have a great hold, on windy days you’ll have to learn to shoot on the move as the wind blows your muzzle. On those days, you’ll have literally fractions of a second to let off your shot in the 10, or miss your chance. Triggering is the other half of the equation. You can have an X-ring hold, but if during the trigger pull your hand exerts unwanted direction on the rifle, you can end up with a 9 or worse. This is my major weakness at the moment, even though my trigger pull weight is only about 12oz. On the SCATT I see my 10′s and X’s turn into 9s and sometimes 8′s because my triggering disturbed a 10-ring hold, or was not fast and aggressive enough. I have a really hard time activating only my trigger finger on the pull, and instead, almost reflexively, my other fingers move. (I have heard that this is normal for men, and women tend to be better shooters because their fingers are more inclined to work independently of each other, but it could be a shooter’s wives’ tale….). I can move my trigger independently of my other fingers, but it takes a lot of concentration, and in standing shooting you don’t have that luxury–the triggering has to be pure reflex. I find myself not having the confidence to reflexively fire on a good sight picture because I’m not confident my hand is going to do the right thing. I feel like that is *the* hurdle I need to overcome to move up from Master to High Master. What Segey’s technique does for me when I do it, is that it helps my short-term “muscle memory” in my hand so that as much as possible, only my trigger finger is moving. It sort of points out to me any other muscular flaws in my grip so that I can adjust those too, as you do have to exert some force in the opposite direction for your trigger finger to be able to move straight back. I have a 2-stage trigger with a very long 1st stage pull, so it’s perfect for this technique as I won’t have to worry about accidentally touching off a round. So far on the SCATT I’ve had tremendous improvement in both minimizing muzzle movement during triggering, and being more consistent with good trigger releases. I find the technique also lends itself to minimizing over-travel force as well. I’ve had 10 shot strings with more deep X’s and 10′s and my average is pushing up to 96, which is flirting with High Master territory. Hopefully it will translate to live fire, and maybe this is the key to me getting off my current plateau! I’m cautiously optimistic. Once again, I’m not sure this is why Sergey does it, but this is the effect it has for me. I could also imagine that it could just be a stepping-stone to triggering technique that does not need it, but I can’t see how it could hurt even then. This entry was posted in Sergy Rickhter, Shooting Tips on July 31, 2013 by jMark74. This entry was posted in Uncategorized on July 29, 2013 by jMark74. The problem with his statement lies with the meaning the present day “gun-enthusiast” community gives to the word “marksmanship.” By “gun-enthusiast” I refer to people who do not actually compete in shooting sports or seriously train as professional gunfighters. I think the standard for what gun-enthusiasts consider marksmanship today is vastly different from what it meant a few decades ago. Today, many seem comfortable to judge marksmanship by what can be achieved under very controlled and stable conditions. Whereas, a few decades ago, the gun-enthusiast community seemed to have a better sense that marksmanship is judged by what can be achieved under unstable, dynamic, and uncontrollable situations. So what changed? Quite simply, the background, experience and knowledge level of the crowd. Weekends at the local ranges used to consist primarily of people with a lifetime of shooting experience, often with some hunting, competition, or military experience under their belt. These folks understood that any schlemiel can shoot decently from a shooting bench, but it is quite another matter when a) the shooter is moving, b) time is of the essence, c) the target is moving, d) the wind is blowing or e) all of the above. They understood that a shooter from a bench can hit a 750 yard target, but miss a deer at 75 feet if he hasn’t the real skill. Those people are still a component of the gun-enthusiast community, but their voices are being drowned out. For the past decade or so, the prevalent fad at the public ranges has been what some call the “tacticool” role-playing game, where fun at the range consists of mimicking the firearms of special forces soldiers, SWAT officers, FBI agents, etc. A day at the range for many of these folks is standing stationary with a black semi-automatic pistol with a laser sight, making two handed shots at targets 7 yards away or less. Good “marksmanship” is the ability to keep most of the shots somewhere on the bad guy (yes a shoulder or wrist hit counts) on the target. If rifles are shot, they are AR-15s, used with the rifle supported on some kind of bench set up, and almost always with some sort of scope that likely cost more than the rifle. A spin-off of the tacticool genre is the wildly popular “Zombie” theme, which as best I can tell means changing the black semi-auto guns to some kind of neon green color, and shooting at targets with Zombie-themed imagery. Very few of these people go on to actually train or compete in tactical-inspired shooting disciplines like IPSC or IDPA, where “marksmanship” means not only speed, but scoring hits on actual “kill zone” sizes, all while having to actually move around like a tactical “operator” might, and sometimes with moving and dynamic targets. Many of them have no idea that a sling is for more than just carrying a rifle (and most don’t even own a sling), and without a bench from which to shoot their rifle, I’m not sure they would know how to hold it. Sure, from the bench they can drill .5″ groups, but ask them to stand and shoot the rifle unsupported, and suddenly you’ll see off-paper misses. Don’t get me wrong, recreational shooting is supposed to be fun and I do not judge anyone for how they choose to spend their time and money at the range. Frankly, those cowboy action shooters who get dressed up in period clothes using period guns seem to be having the most fun out of all the shooting disciplines, and more power to them. But lowering the standard for “marksmanship” is not helpful or positive to those of us who know that even a 0.0MOA laser rifle with a laser sight and ballistics computer in the wrong hands will loose to a “real” marksman with a 30 year old Remington 700. Or, as my readers know, with an 80 year old K98 Mauser. When I bought my current .308 match gun, there was never really any doubt that it was capable of 1MOA or less at 600 yards from the bench. But it took me nearly a year to prove I could do it from the prone slung position, with irons. The problem, as I see it, is that statements like Robert’s could have the effect that other gun-enthusiasts, and the non-shooting public, will not appreciate the incredible skill and practice it takes to shoot competitively away from the bench. They will wrongly assume that shooting for distance while standing, kneeling, sitting, or prone is easy, provided you just buy the right (and expensive) gun. They will look at Olympic-style and other shooting sports as silly, and have little interest in developing dynamic shooting skills. 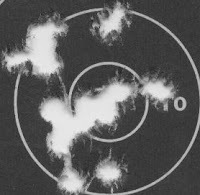 For a great blog that keeps its marksmanship ‘old school,’ check out http://artoftherifleblog.com/ which the author describes as “A Shooter’s Quest for Excellence in Marksmanship.” Emphasis on the word “quest,” which is a concept seemingly lost on the modern gun-enthusiast community. Too many of them think they’ve already arrived, because they bought the same gun used by the Navy Seals. Oh well, as for me I guess I’ll just keep doddling away. This entry was posted in Uncategorized on July 25, 2013 by jMark74. This entry was posted in Maccabiah Games on July 24, 2013 by jMark74. More and more intelligent Americans have finally opened their eyes to the facts, and come to realize that George Zimmerman was not a racist, and that race played no role in his defensive shooting of Trayvon Martin. In an attempt to save face, many are now blaming Florida’s gun laws, claiming that so-called “Stand Your Ground” (SYG) laws need to be “re-examined” or repealed. In the interest of justice, let’s “examine,” and where possible, compare to Jewish law. First and foremost, we need to define what we mean by a “stand your ground” (SYG) law. What we are really talking about is whether or not a person has a duty to attempt a reasonable retreat before using deadly force in self-defense of an objectively reasonable perception of imminent death or great bodily harm. This is sometimes called a “duty to retreat.” It will be helpful to understand the history and development of the “duty to retreat” in order to have an informed and thoughtful opinion. In the old English common law (from which much of US law was derived), a person was required to retreat “to the wall,” so to speak, before using deadly force to defend himself. That English common law developed in the feudal days when men settled drunken disputes in taverns with swords. The idea was that if a man pulled a sword on you, you were required to, if possible, retreat until your back was “to the wall” before you killed him. The hope was that perhaps the man who drew his sword would have second thoughts, or be so drunk that he couldn’t advance on you without stumbling over, and perhaps a life would be saved this way. It was also thought that perhaps a retreat would eliminate fights and deaths where there is some initial misunderstanding or mistake as to whether one is actually being attacked or not. It was thought that a defender under actual attack wouldn’t be giving up too much by initially retreating, sword play being what it was. 7. When a person breaks into [a home] —whether at night or during the day—license is granted to kill him. If either the homeowner or another person kills him, they are not liable. The majority of US states adopt some sort of laws that can fairly be called a Castle Doctrine, but vary by state to state. Some states do not require that burglar actually attack you in your home before you can kill him, some do. But generally speaking, in many states you are not required to hide and cower in your bedroom or bathroom, rather, you may confront the burglar if you feel that is the best strategy under the circumstances and not be second-guessed later by law enforcement or a jury. Thus, what a SYG law does, in practice, is extend the Castle Doctrine to the public square. To many people, having no duty to retreat and cower within your own home is intuitive and morally fair. Extending that doctrine to the grocery store is another question, where the Castle Doctrine is based on there being something sacred about the privacy and serenity of a person’s home. The thinking is that although a person may police their home as they please, society ought to be able to impose restrictions on a person’s self-defense in the public square. The critical issue though is not whether a person should, morally or otherwise, first attempt retreat when faced with a seemingly deadly attack. The question, supposing the law does impose a duty to retreat, is how do we determine after the fact whether or not the attempt at retreat was sufficient? This entry was posted in Uncategorized on July 22, 2013 by jMark74. Today we had a “practice match” to get the local shooters headed to the Nationals at Camp Perry ready (I’m not going this year). I started the day rather poorly, and could not figure out what was off. I eventually figured out that my front sight post was loose with the match almost over. 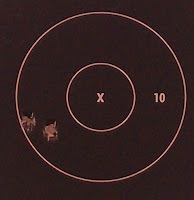 Oh well, I tightened it down and things went back to normal when I hit the 600 yard stage. The sight was dialed in for the 600 yard prone stage. I was eager to see if the concentricity tool had done anything to improve the ammo. 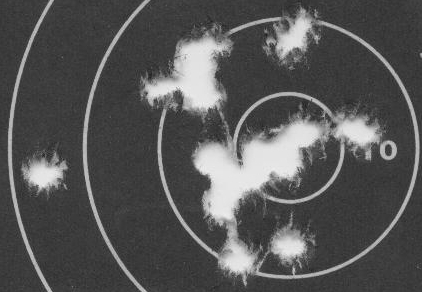 Luckily, the way the pit rotation worked out, I was able to take a picture of my target with the pasters marking my hits. You see, the way NRA High Power matches work is that competitors take turns doing “pit duty” behind a safety berm, where they raise and lower the targets, marking hits with a large colored disk in between each shot. This is because it would be almost impossible to see your hits at 600 yards without a humongous spotting scope, but an inexpensive 20x spotting scope can easily pick up the marking disk. Well anyway, usually I never go back to the pits after my 600 yard stage, but this time I did and was able to see my group as opposed to just one shot at a time. For perspective, the 10 ring is 12″ wide and the X is 6″. So I ended up shooting the same exact score as last time (a personal best at 600 yards), a 193, which is pretty good. I had one mental lapse and shot a 7, and man, if I could have that shot back I could have done 195 or better and been in High Master territory. Even if that 7 had broken the 8 line I would have had a personal best at 194. Oh well. I also got a little lucky where that high 9 just barely stayed in. It was also very hot and humid, so I was soaked with sweat under my shooting jacket, which makes the sling and shoulder feel unstable–I found myself breaking position to reset things more often than usual. Otherwise, as you can see the group is relatively tight in the 10 ring. It was just one of those days where the shots just circled the X ring. 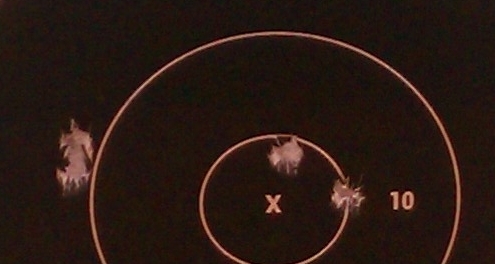 So I think the concentricity tool may have helped slightly at 600 yards, maybe .25MOA or so. One thing I am now convinced of is that my rifle and ammo are capable of shooting a “clean” (all 10s), take out the human error and the rifle seems to want to shoot 1MOA or less at 600 yards. I just need to make that happen. The load I’m using is a 155gr Nosler HPBT bullet, with 43 grains of 4064, which is a mild load. This entry was posted in Uncategorized on July 20, 2013 by jMark74.